A few days ago I was contacted from the website Shop Hair Extensions to review their products. This site offers many many different kinds of extensions (clip in, pre bonded, tape and micro loop) in various styles (curly, straight, wavy) and lengths with best virgin hair extensions to make possess your dreamy hairdo!. And of course, there's also a huge range of colors available so you're bound to find the right one to match your natural hair! All extensions are 100% natural: this means that you can treat them like your real hair, wash it, straighten it, blow dry it even dye it. Since I already have very long hair, I decided to use my friend Martina as a model to show u better the final result... and I think she looks really amazing with her new hair! This kind of extensions are also very easy to use: believe me, I'm crap at anything manual, so If I managed to do it, anyone can!... so what do u think? Qualche giorno fa sono stata contattata dal sito Shop Hair Extensions per una review dei loro prodotti. Questo sito offre diverse tipologie di extensions (adesive, a clip etc.) in vari stili (ricce, lisce, ondulate) e lunghezze. E ovviamente vi è anche un ampia gamma di colori disponibili, così che è praticamente impossibile non riuscire a trovare quello che si adatti perfettamente ai nostri capelli naturali! Tutte le extensions sono al 100% naturali: questo significa che potete trattarle come i vostri veri capelli, lavarle, lisciarle, asciugarle e perfino tingerle. Poichè io ho già i capelli molto lunghi, ho deciso di sfruttare la mia amica Martina come modella per mostrarvi meglio il risultato finale.... e credo che sia davvero bellissima con la sua nuova chioma! Questo tipo di extensions sono anche molto facili da usare: credetemi sono una frana in tutti i lavori manuali, quindi se ci sono riuscita io potete farcela tutte! ... Quindi, cosa ne pensate? Ma che spettacolo !!! 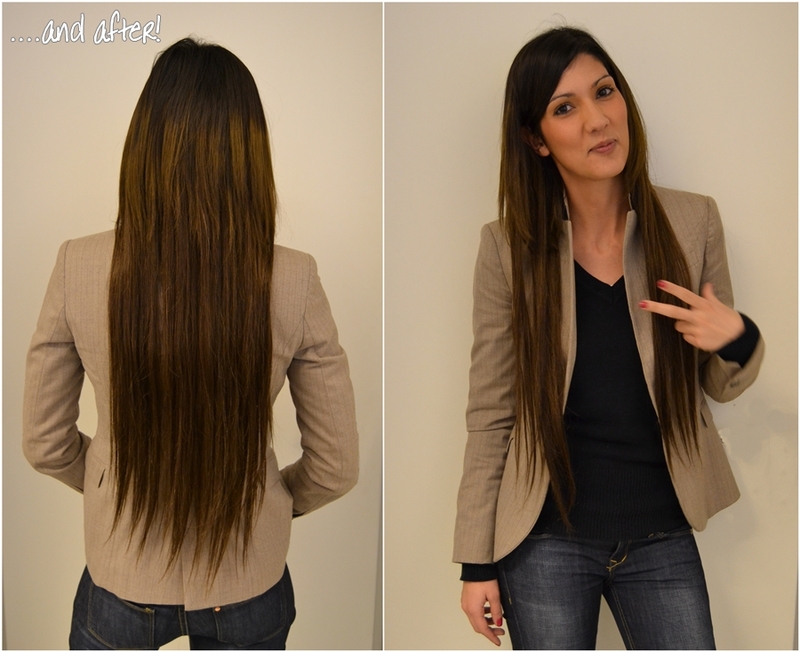 Io adoro cambiare look con parrucche ed extencion e queste sono bellissime !!! Alla tua amica donano molto i capelli lunghi :-) Oggi ho fatto un POST un po’ diverso, se ti va passa a vederlo !!! Buona giornata e buon week end ! Se ve genial, perfecto para cambiar de look!!! Love these photos, so pretty! And the hair looks really natural! your model is really cute. thank you for the review. Lei e' molto carina con i capelli lunghi ma in generale e' una bella ragazza. Io spero che i miei capelli cresceranno velocemente. Mi mancano i miei lunghi capelli. i'm following you=) now it's your turn. Looks beautiful on her and very natural. I think I prefer her with long hair than short! Oh this looks really good and natural. In the past I have worn fixed extensions by myself, too, but my hair is too fine for that and after a while I have lost each streak. Non sono una fan sfegatata delle extensions ma l'effetto non mi dispiace! Amazing! It seems natural and its great on her! personalmente non amo le extension, ma devo dire che sembrano naturali quindi approvo!! That looks good! Such a big change.. I love hair extensions. I wear them once or twice a year. These look amazing! i'm following you. hope you do the same! Veramente bellissima la tua amica con le extensions! Btw, you are very beautiful! They look great on her . I think I'm needing hair extentions. Interesting! I love the length and the hair looks very smooth! che belli!Mi piace la treccia! You really look lovely. What a great choice. Che bell'effetto!! Un bacio Elisa, buona domenica!! those extensions are nice !!! you look great with longer hair ! I think you should consider growing our your hair.. long hair suits you. I think she is more bauiful with short hai, but the extensions are nice! I love the way it looks in a braid! great choice! you looks so beautiful dear! You look so beautiful, i love your hair !!! Quando si dice "volere è potere!" Risultato pazzesco, invitante per quante attendono secoli prima che i capelli crescano! ooh really beautiful! I've always wanted to do some extensions! your new follower! can't wait to see you in my followerslist! Your friend looks amazing with long hair too! te queda genial, aunque yo soy mas de medias melenas!!! Wow what a difference! I love your hair color. Un bellissimo effetto, ottimo risultato! Wow, your hair looks absolutely incredible! 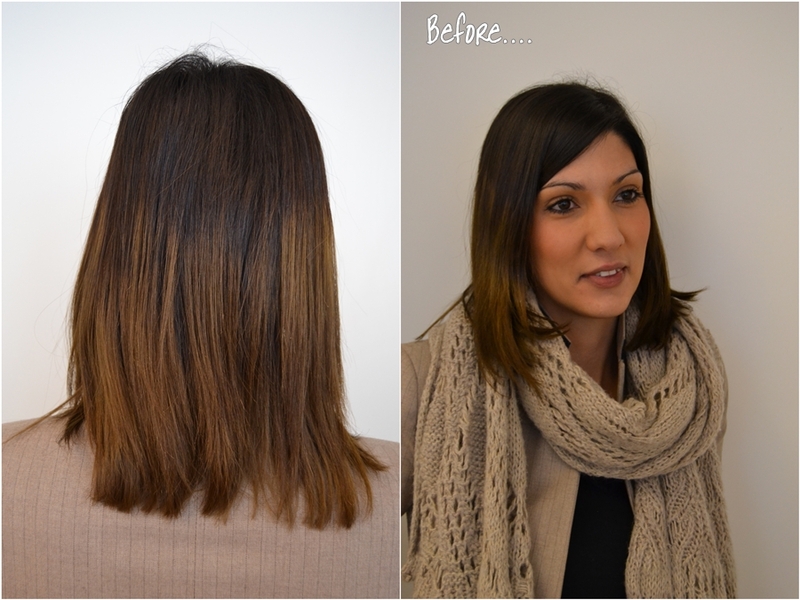 Have always been sceptical about hair extensions but you've convinced me otherwise! Wow, I think your hair looks wonderful both ways. I haven't tried extensions before, but have always thought they would be a great idea. You can have a great shorter style, but with them immediately change your look without actually changing your hair. Oh wow! She looks so amazing, loving her new look! Love your hair girl !! Gjee, this looks great, love the hair. Where would we be without hair extensions !